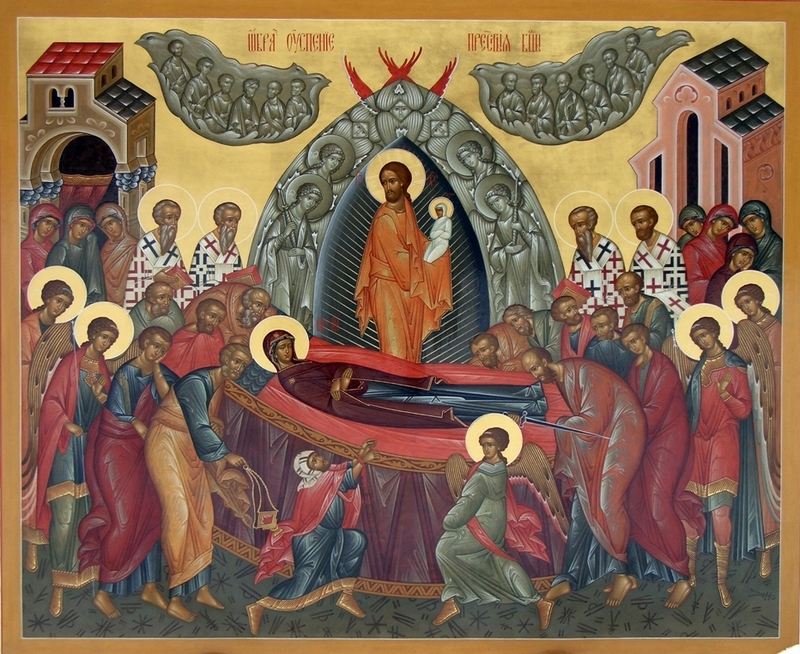 Today we mark one of the Twelve Great Feasts, the Dormition of the Most Holy Theotokos. We are celebrating this feast in the principle temple of our Church: the Patriarchal Cathedral of the Dormition in the Moscow Kremlin. Along with the entire Church, we rejoice in an event that has been passed down to us by the Holy Tradition of the Universal Church: the blessed repose of the Most Holy Theotokos, her Dormition, which has become a feast day. If we transfer our gaze from this event to modern life, we will notice a profound contradiction between two understandings of death. 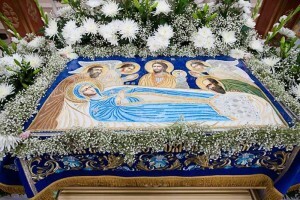 Blessed repose, dormition, falling asleep – the word “death” is not used in reference to the Theotokos. Incidentally, another word used in ecclesiastical parlance is derived from here: “reposed” – not died or perished, but reposed. We see that there is a different understanding of death. On the one hand, there is the understanding connected with the triumph of the Mother of God; on the other, there is our ordinary understanding of death as a tragic end, as the termination of all things. One feels animal fear, the fear of death, before this tragic end. How greatly this fear of death contradicts the basic value judgments of modern society, a society of consumerism and prosperity! But this very society, imbued with false values, recognizes the impossibility of joining its ideals – those of unlimited consumption and pleasure – with the fact of death. But how does today’s society, today’s pseudo-culture, reply to this contradiction? It replies to this challenge of worldviews by, as it were, ignoring death. A different picture of life is drawn for us through advertisements and the cultivation of these same false values that turn our gaze away from death. If we are to speak of burial practices, we can note that in many countries – especially in prosperous ones – everything is done somehow to mitigate people’s contact with the dead body. The coffin is not opened during the funeral service – in fact, it is generally not opened at all – and people always bid farewell before a closed coffin. More often than not, the coffin is lowered into the grave when people are already leaving the cemetery. For this reason, it is covered with flowers or spruce branches in such a way that the very act of burial goes unseen. The widespread custom of cremation also serves this end: the coffin goes out, and there is no real contact with the moment of burial. The Dormition of the Most Holy Mother of God was a triumph of the Church: the Apostles gathered together, placed the tomb of the Mother of God in Gethsemane, and never again found it, because the Mother of God’s body disappeared. A firm tradition of the Church has passed down to us the tidings that the Mother of God’s body was caught up into the Heavenly Kingdom. S0me Holy Fathers of both the Ancient Church and the Russian Church – among whom St. Ignatius (Brianchaninov) should especially be remembered – compared the mystery of the Dormition of the Most Holy Mother of God with the Savior’s Resurrection. There is no death: there is dormition and departure. Reflecting on the theme of departure, the Holy Righteous John of Kronstadt says that departure is just a change of place: a person “departs” and his soul occupies a place in another world, another age, another time. 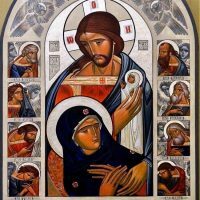 Did the Mother of God fear death? No. Did the Holy Apostles fear death in the face of violent, martyric deaths? No. The Apostle Peter, originally fearing the persecution that broke out under the Emperor Nero, decided to leave the capital of the Empire at the urging of the Christian community in Rome. But while leaving Rome, the Risen Lord met him and asked: “Whither goest thou?” This question alone caused Peter to return to Rome and joyfully to accept a martyric death. And how many testimonies do we have in the lives of saints! We see clearly that they did not experience any fear of death, but prepared themselves for death as for a truly great event in their lives, by which one passes from an earthly existence to a heavenly one. So where does the fear of death come from? Reflecting on this theme, the Holy Righteous John of Kronstadt rightly states that God did not create death, but that death came into people’s lives through sin. He goes on to write: “Death shall frighten us so long as we abide in sin.” This inner connection between the fear of death and sin is completely obvious. If someone lives according to the law of the flesh, if he sins and never thinks of God, then when this spiritually unprepared person – who lives in this world’s vanity and whose life is bound only by the values of this world – comes face to face with death, there will be fear and terror. There will be mortal fear, because of the presence of sin. St. John Chrysostom teaches us how to overcome this fear of death: through repentance, prayer, victory over the passions, labor, patience, and spiritual peace – that is, by living according to God’s commandments. 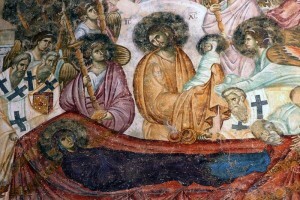 Through the feast of the Dormition of the Most Holy Theotokos and the experience of the Church, the truth is revealed to us that the religious way of life, the Christian way of life, is not only dispensation, blessedness, and happiness in this earthly life; it is not only the acquisition of authentic goals; but it is also the overcoming of the fear and apprehension of death with a calm and peaceful spiritual state, as the natural completion of the earthly portion of human life. Such a view of life and death has great power for the human person, before whom there are no barriers and who fears nothing. It is upon this attitude towards life and death that true struggle, valor, and the ability to give one’s life for another are based. Would someone give his life for another who is bound to this tawdriness, to this modern consumer life, for which the main value is here and only here? Why would he take the risk? Why would he give his life for another? Why would he sacrifice what is most precious? Within the framework of a godless worldview, it is impossible to justify heroism, struggle, or self-sacrifice. If people who do not consider themselves religious do undertake such struggles, this does not mean that their motivations lie in the material plane. This is a manifestation of a latent, rudimentary religiosity, which becomes part of human life through one’s upbringing, through the values that are instilled in one. But if we destroy this rudimentary religiosity, then we will become a completely different society, a completely different people, incapable of either sacrifice or struggle. Such a society does not and cannot have a future, because people’s upbringing in faith is a question of life or death – not only of society, but even of the human race. This is why the preaching of the great spiritual values that have been revealed to man through the Divine word is the principle foundation upon which the future of the human race depends. Remembering our Most Holy Lady Theotokos and Ever-Virgin Mary and her glorious Dormition, let us always remember that the Dormition, the Mother of God’s death, is a great feast day of the Church. And in this glorification of the death of the Most Holy Theotokos lay the great faith of all preceding generations that death does not mean the end of life. As a great sign of the fact that after death comes resurrection, the Most Pure Queen of Heaven was caught up into the heavenly abode of her Son with her soul and body, as a sign of man’s immortality, as a sign of eternal life, and as a sign of Divine omnipotence. Amen. 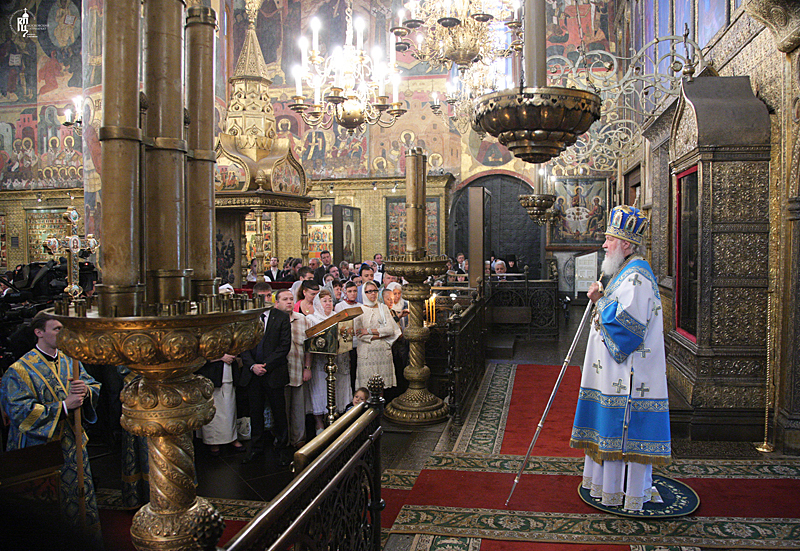 Delivered on August 28, 2011, in the Patriarchal Cathedral of the Dormition in the Moscow Kremlin.